Microsoft Powerpoint 2016 16.11 – Microsoft’s presentation designer. Use the laser pointer and pen tools to call attention to your point. Zoom into points you want to emphasize. And use the timer to stay focused, on time, and with your audience tuned in. With Slide Navigator, you can quickly switch slides—in or out of sequence—from a visual grid viewable to you at a glance. Your audience sees only the slide you’ve selected. With auto-extend, when you project your presentation to a second screen, your slides automatically appear on the correct screens. No fumbling with settings and equipment. Jump-start your creative process and get your presentation into high style with a click. Choose from an array of polished design themes and theme variations. To add special-effect visual impact to your story, insert and edit images and video. Plus, apply inventive transitions between slides and add pre-set animations and charts and graphics. Add a designer’s touch. With built-in alignment guides, you can intuitively align shapes, text boxes, and videos on your slides. Embedded fonts: Embedded fonts ensure that your presentation looks the same on every computer and people experience your content as you intend. Next story Microsoft Word 2016 16.11 – Powerful and beautiful word processor. Previous story Microsoft Excel 2016 16.11 – Microsoft’s spreadsheet app. 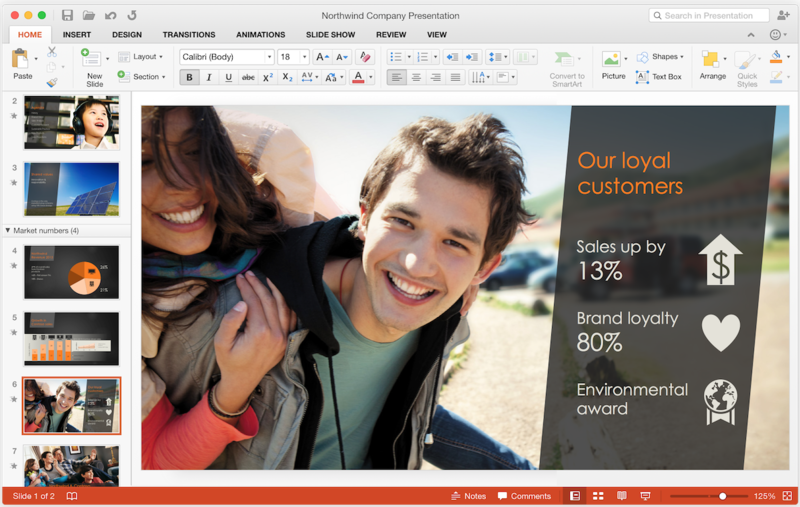 Microsoft Office 2016 16.11 – Popular productivity suite. Microsoft Excel 2016 16.12 – Microsoft’s spreadsheet app. Outlook 15.32 – Messaging client for the Microsoft Exchange Server.